Jason and Abner did not do to well in Sunday school today so I had to lay the law down and not allow them to come along to eat afterwards. Abner will be allowed to come back next week but I told Jason that he is going to have to stay at home next week. You may consider not being allowed to go to church a weird punishment. In fact I remember back when I was a kid I would have considered staying home from church a reward and not a punishment but these kids love going along to church. After taking Fernando, Noel, and Angela out to Taco Bell I headed to the coast to pick up Angelica and her Daughter. Angelica is scheduled to have surgery tomorrow. Calin 4 years ago and now. Today was the first day of school for all of the kids. After they left for school I looked at some pictures that I took just 4 years ago when we put some of them into school and was amazed at how much they have grown. It looks like things will never change because Calin soon came back and told me that his teacher did not show up today. At least Fernando’s has the decency to tell the kids that she is going to be sick a few days in advance. This morning I once again went to the telephone company. I had received a phone call telling me that my phone would be shut off for not paying my bill. The man at the desk told me that I owed them over $100. I told him that I had just paid my bill he told me that the computer said that I was mistaken. I told him that the computer was mistaken. He told me that computers don’t make mistakes. I told him that the people that run them do. He told me that …. Anyway this was beginning to turn into a Guatemalan stand off. I Then showed him the receipt that I had saved from my last payment and reminded him that it had been printed on one of their mistake proof computers. He looked at the receipt then apologized for the mistake that had been maid and wished me a good day. Calin, David Piper, and I went to Hermano Pedro at around 11 and signed 3 of the kids out to lunch. On the way out of the door we met some people who were interested in volunteering at Hermano Pedro. We invited them along to lunch so that they could get to know some of the kids. While we were there we were met by another friend so the 3 kids got plenty of attention from the 2 to 1 ratio of adults. It was good for them though and they enjoyed it. After lunch I gave the adults that had joined us a tour of the orphanage. Most of the kids up in malnutrition who had cleft pallet have now had there operations and they are doing great. It is such a blessing that these surgical teems from the USA and other countries are willing to volunteer their time and make a difference in so many lives. Pedro, one of my favorites came down with a cold so he will have to wait another month before he has surgery. Fortunately he seems to be able to eat well and is getting fatter and healthier by the day in spite of a rather severe cleft pellet. Later this after noon I was joined by David Penner, who is from the Josiah Foundation, and 3 friends who have just arrived here from the USA. I will be showing them some of the things that our ministry is involved in over the next few days. The kids did not stay as long as usual tonight. My choice not theirs. I like them to get home earlier on school nights but don’t want to send them home to early or they just stay out and play in the alley. Anyway I am going to take advantage of an empty house and head off to bed. Today was an enjoyable but extremely busy day. After picking up the 4 people that are visiting here from the USA we went to Camperos for breakfast. Benjamin, who was going to serve as our interpreter , was already there waiting for us when we arrived. After picking up a few groceries for one of the families that we were going to visit today we headed out. Our first stop was at the home of Maria, Fidel, and their grandmother. It appears that the bathroom that we built for them and their relatives was a good investment. When we arrived Maria was just coming out of the shower and grand mother was going in. 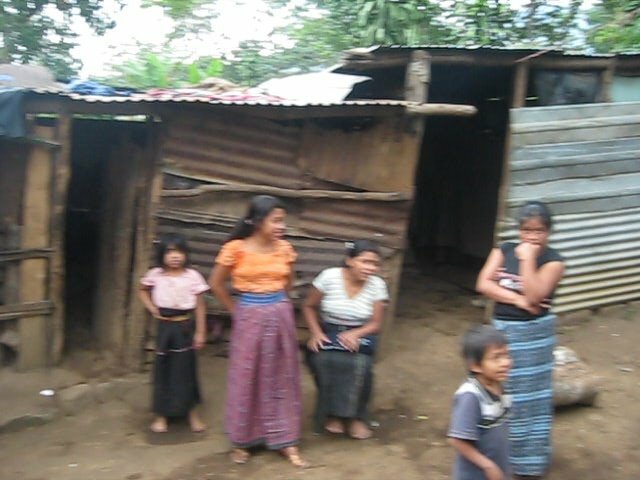 (unlike most similar situations that we run into here in Guatemala none of us were very embarrassed.) This bathroom had been built large enough so that who ever was using the shower had plenty of room to get undressed and dressed inside of the bathroom. We are considering getting them a door though. Since our last visit only a few days ago the family has torn down most of the old adobe house that Maria had lived in. They are leaving about 6 feet of it stand so that they have a place to store things. I have little doubt that it will crumble when ever the next earthquake hits but at least Maria is no longer living in it. While we were there we made arrangements for the local brick layer who helped us build the bathroom to come in and do the Cement work for the floor of the Prefabricated house that we plan on putting up for Maria. Some of Maria’s relatives are planning to help him but we decided that it would be a good idea to have one trained professional even though it meant having to dish out $6 per day for his services. Our next Stop was at the home of Maria. No I am not repeating myself. I am beginning to think that close to half of the people in Guatemala have the name of Maria and that the only reason that the other half are named something else is because they are men. With the men there seems to be a broader choice of names but there is still a good chance that their name will be either Jaun or Carlos. 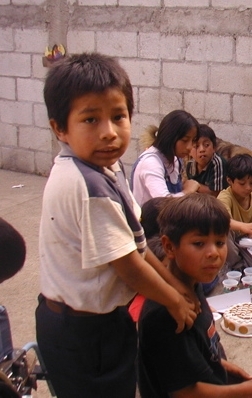 Although there are a few families that steer away form the norm and name their sons Jaun Carlos. Anyway this Maria is the one that lost her husband when he was killed by a hit and run driver a few months ago. The group that was with me from the Josiah Foundation wanted to see some of the homes that we had already constructed. For some unknown reason I had felt that out of all of the poor families that we were going to visit today that we should bring some groceries to this family. I had previously been told that the roof had blown off from the structure that they had been in but was amazed to see that everything from about 3 feet above the ground up had been completely destroyed by the wind. Maria and her 4 children had been in it only a few minutes before it was demolished by the wind but she fearing that it would not with sand the high winds she moved the entire family into the new home that we had HAPPENED to build for them only a few days earlier. Only Maria a niece and her 2 younger children were at home. Her 2 boys who up until a few days ago had never been to school were now in school. It is hard to believe that just a few dollars a year had kept them from going in the past. Another neat thing that HAPPENED while we were there was a phone call that I received from Gordon. I had told him a few days ago that we were planning on seeing Maria today. Gordon sounded a bit disappointed when I told him over the phone that we were already at Maria’s house. He said that he wished that he had known a few hours earlier but he had just been told that Maria and her children had run out of food and he had hoped that he could have caught us before we went to Maria’s so that we could have taken her some groceries. The group of people that were sitting with me in Maria’s house overheard the conversation and almost dropped the groceries that they were holding in their hands. I am glad that they didn’t though because the sack of beans would have likely broken open and scattered all over the floor of Maria’s new home, and 2 dozen eggs would have made quite a mess on Maria’s new floor. I wasn’t quite sure weather or not to chalk this one up as a GODINCIDENCE or just a COINCIDENCE until Gordon came back on the phone. He told me that it had to be a GOD THING that we had brought in some groceries but still wished that he had gotten a hold of us because he had received a specific request for beans and eggs. Next we went to Tecpan to where Pastor Juan lives. Pastor Juan and his family have had the blessing of having American teems that have come in over the past 3 years build him and his family a nice home and build a church for their ever growing congregation. Much like most pastors Juan has to do outside work in order to feed his family. He has been working on Ronny’s house down near the coast so when the team comes in to work on it in February they should be able to nearly finish it. Today we stopped by his house to pick up some lumber that will be needed there. After visiting a while and then loading the lumber on top of my car we headed back towards Chemaltenango. After stopping off in Chemaltenango for lunch we headed to Antigua and picked up Angelica and her Daughter. Her surgery went well yesterday and she was already being released today. On our way to bring Angelica an hour and a half stop at a detour gave some of my American friends a lesson in patients. The all did reasonably well but no As were handed out. Although I must admit that after an hour and a half of not moving more than a few feet I was getting a bit impatient. 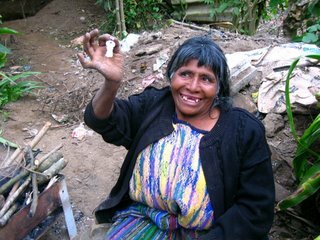 It was nearly dark when we finally arrived at Angelis home and even though we still had to drop off some lumber at Ronny’s house there was no way that we could decline having a coke while Angelica’s husband loaded bananas into my car. When we finally arrived at Ronny’s house everything was dark except for one candle that was burning under a lean-to next to their house. We visited for a while before giving them the lumber that we had brought and most of the Bananas that we had just been given. We also left a bit more money since they still didn’t have enough to put all of their kids into school. I wish that the public schools did not have to charge the students anything because if these kids don’t get an education there is little chance that the cycle of poverty will ever end. Since we got home so late last night Benjamin stayed here over night but his grandfather was here for him bright and early this morning. I think that Benjamin was hoping that he could once again join us today but there were horses to feed and school work to do. After picking up the group from their motel we headed straight to Antigua and had breakfast there. The rest of our day was spent at the orphanage. Seeing the kids locked up in there cribs was nearly more than some of the people that I had brought along could take. Even a few of the grown men cried. I was one of them. You would think that I would get used to it but fortunately I don’t. 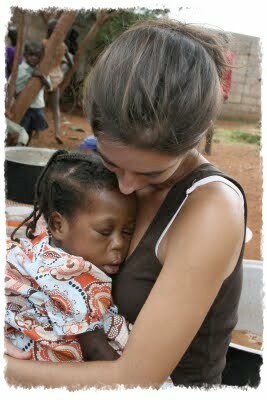 The kids that are in malnutrition who had the cleft pallets are doing great after their surgeries. 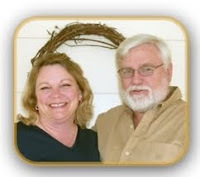 It amazes me to see what the team of doctors that operated on them were able to do. Pablo is the only one who did not get operated on because he had a cold but he is scheduled for surgery some time in March. Most of the others will be going back to their homes soon. I will miss them but am happy that they have families to go back to. Byron, Jennifer, and Perla are gaining a little weight but all 3 are still very frail. 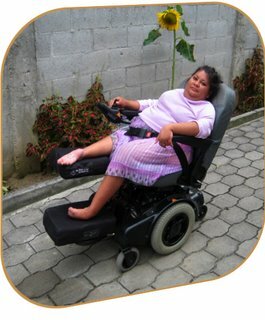 Today I readjusted Perla’s wheelchair but had to be extremely careful how I held her and how I set up her wheelchair. I think that the slightest pressure in the wrong place could easily break one of her bones. I can still nearly hide the leg of this precious 5 year old girl behind my thumb. By the time I had finished seating her she had nearly fallen asleep though and that is always a good sign. We left the orphanage at around 4 PM. We figured that this would give us a chance to rest up a bit before having a giant Pizza feed at my house this evening. On our way home we stoped or at the home of a young man who I had been introduced to through some friend of mine that live in Antigua. We had given him a walker a few weeks ago but he still needed a wheelchar in order to for his parents to take him any distance. 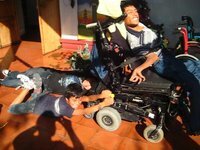 To say that he was thrilled whit his wheelchair was an understatement. I didn’t get a head count of the number of neighbors that came over for Pizza tonight but I know that we ordered 10 large pizzas that’s 8 slices of pizza times ten. I tried to keep the limit at no more than 2 pieces of pizza each, so considering we had no Pizza left by the end of the night there must have been some where around 40 people in and out of my house. We all had a good time though and the group that was here from the States had a great time meeting and playing with the kids. Everyone pitched in and sort of cleaned up so I didn’t have to bad of a mess by the time everyone went home. I am ready for a night’s sleep though so I will once again say goodnight. This morning I took the group up to Santa Mara Dejesus to see the school that Judy and Amy run. Judy was gracious enough to take time from her busy schedule to show us all around and to share with us how God has blessed them over the years. She took us into several of the class rooms that were filled with happy children who would not be in school if it were not for this school. I think that one of the people who is the most surprised at what God is capable of doing, if we allow him to be in charge, is Judy herself. Little did she know even 2 years ago that a small school that was in a building that was once nothing more than a house would materialize into a 3 story school that continues to grow. This after noon I took the group to visit Macaria who is the woman who inspired the opening of the Bethel Ministries wheelchair shop years ago. She was seen dragging herself across the highway one night. 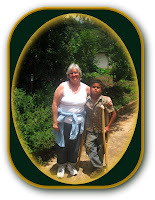 She received a wheelchair from the first busload of 14 wheelchairs that came down from the States. Macaria lived with her two children in a leaky structure. 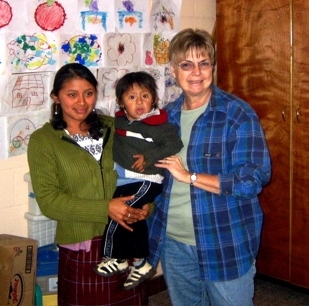 A few weeks ago we were able to once again share God’s love with her by giving her a new home. While we were there today we put a lock on the door of her house because up until now she had been afraid to leave any of the few meager possessions that she owns in her new home. The group that was with me was truly blessed by meeting this dear Christian lady and her family. This evening I dropped the group off at a bed and breakfast in Antigua. They plan on spending the next few days in Antigua visiting with a pastor and his family that they met on a previous trip. Tonight the number of kids that were in my house were less than last night. That was perhaps for the best because I am not sure that I could handle 30 to 40 people in my house every night. After catching up on a few things here at home Fernando, Elmer, David, and I headed to Hermano Pedro. I had been promising some of the teen age girls that I would take them out for lunch and decided that today would be a good day to do that. I think that out of anyone that we takeout to eat the older girls are the ones that get the most excited about going. Just because 2 of them can scarcely eat anything but liquids it does not at all dampen their enthusiasm on going to Camperos. I think that the fact that both David and Elmer are not much older than them added to their excitement. Both were awesome with the girls and didn’t seem to mind in the least feeding some one their own ages from a baby bottle. Fernando who is much younger than our 4 invited guests did equally as well at helping. I was also happy to see the general reaction that we got from most of the people on the streets and in the restaurant. Several police officers helped stop traffic as our little procession of wheelchairs crossed the street and a number of people lent a helping hand when Fernando had difficulty pushing his wheelchair across the cobble stone streets. Even most of the people in the restaurant gave approving looks and several even came up to our table to talk to us and the girls. There was one group of about 20 people that were seated at a row of tables that kept staring at us like they wished that they did not have to eat in the same restaurant as us but they were outnumbered by people that seemed to approve. Besides if they felt that they didn’t want us eating next to them they had the choise of leaving. 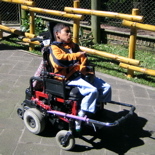 We had wanted to spend more time in the park after lunch but I received a phone call from the wheelchair shop telling me that some one had come in from Aguacatan which is 6 hours away to have his power wheelchair fixed and they could not figure out the problem. They wanted to catch a buss back to Aguacatan at 5:00 so I told them that I would try to get to the shop by 3:00 and see if I could figure out the problem. By the time we got the girls back to the orphanage we only had about a half hour before we had to head to the shop so we quickly went up to the malnutrition ward to see some of the kids that we have fallen in love with. My hart sunk when I saw that Jennifer’s bed was empty. I prayed that she had not died. With a quiver in my voice I asked the head nurse where she was and was some what relieved to hear that her parents had taken her home for a few days. It still worries me though because she is so frail but I know that they love her and miss her badly. 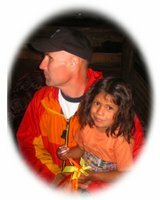 David had a bitter sweet experience when he was told that Susan a little girl that had cleft pallet surgery a few days ago had gone home with her family as well. It is neat to know that the operation was a success and that she is now back with her family but we will still miss her smiling little face. When I got to the shop Alturo told me that he had replaced a faulty computer that was in the power chair that a young man had brought in for his friend but was still having problems with the wheelchair. It took a while but I found the problem and had the young man out of the door in time to catch the bus back to his home. He told me that he has to catch several different busses to get all of the way home and would be traveling most of the night. Spaghetti night tonight. There were 6 of us at first but after I had to send 2 of them home for stilling there were only 4. Of coarse about the time we had finished and cleared off the table more kids started rolling in. I had made plenty of spaghetti though and there was even enough left after everyone had eaten that I was able to take some over to my neighbors. 4 of the kids managed to talk me into letting them spend the night so I guess I better get my shower in before the lines start forming. Tonight Calin, Abner and I are in Saloma which is about 5 hours from home. I waited until the weekend to come out this way so that at least one of the boys could come along and interpret for me. Ludwig a little boy who I met while he was in the malnutrition ward of Hermano Pedro lives in a small town near here. When Ludwig, who has muscular dystrophy, gained some weight and strength back he returned to his home. 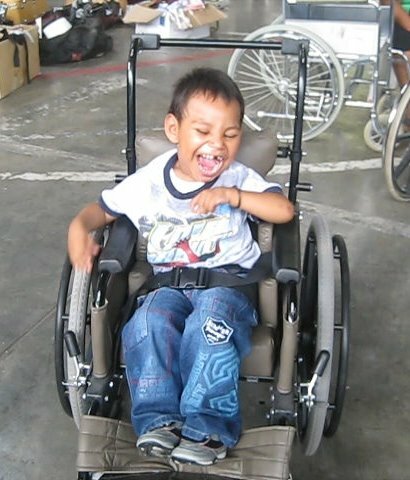 We followed up on him making sure that he received a wheelchair and an education. After just a little private tutoring he was excepted into a public school and is doing well there. Last week he called me to tell me that one of the front wheels had broken off from his wheelchair an his mother now had to carry him to school. About an hour later I received a second call. This time I handed the phone to Abner and he interpreted into English what Ludwig was trying to tell me. 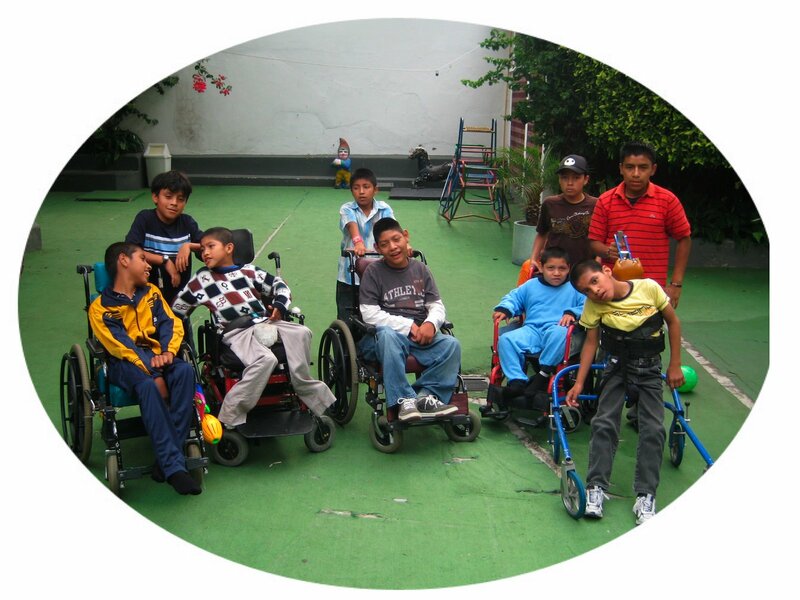 Some where between Ludwig’s Spanish, a bad phone connection, Abner’s English, and my hearing, I got the message that not only was Ludwig’s wheelchair broken but his mother had broken her leg while carrying him to school. It was only on a follow up call a few days later that I discovered that mothers leg was fine but the wheelchairs leg (front wheel) was broken. There are 2 ways to get here from home. The extremely long, slightly bumpy, curvy way or the slightly long, extremely bumpy, curvy way. Since option # 2 usually saves me about an hour and a half that is the one I chose. I have said it before and today proved it again, “Nothing here in Guatemala ever goes as usual.” About half way into our 5 hour trip we encountered a road block. Actually it was just some red buckets and a few traffic cones lined up across the road. I stopped and looked over at a man that was sitting along side of the road eating a sandwich. He slowly got up and moseyed over to my car. He informed me that the road that we were on was closed and would not be open for 2 hours and then he wondered off. A little while later he reappeared so I figured I would ask him what was going on. He told me that there were a few trucks working on the road up ahead so they were closing the road most of the time and only letting traffic (Which meant me since we had seen no other traffic for nearly an hour.) through at curtain times of the day. I told him that I would promise to pull over for any trucks that I met if he would let me go through but he told me that rules were rules. (Evidently he has not lived in Guatemala for too long.) I finally resigned myself to the fact that we would be stuck here for another hour and a half but did not want this to happen to us on our return trip tomorrow so I asked him just what hours the road was open each day. I was told that it was open from 6 AM to 6:30 AM. Then it would open again from 9 AM to 9:30 AM. And that it was always open during the truck drivers lunch time which was from 12:00 PM to 1:PM. I looked down at the clock that is in my car and then at the mans arm and realized that he was not wearing a watch. I then pointed to the clock in y car and told him that it was 12:45 and that according to what he had just told me the road block should have already been open when I arrived there a half hour ago and would still be open for the next 15 minutes. He looked at the clock and then at me, then shrugged his shoulders, walked over to the bucket blockade, moved 2 of the buckets out of the way and motioned for me to go on through. As I drove by him he politely wished me a good day. I forget what I repeated to him but am not sure that it was the same. A few hours later we arrived in Rabinal where we went to Julia’s house. We gave her some cases of vitamins for the kids that attend the school that she is the principal of. I also gave her some vitamins to give to Antonio an his family the next time that her and her husband hiked in to where they lived. Antonio’s family are the ones that Carlos and I hiked into a few months ago along with Julia and her husband. We had originally brought 10 year old Antonio into Hermano Pedro weighing only 21 pounds about 2 years ago. After gaining a good deal of weight and quite a bit of his health his father took him back home about a year later. 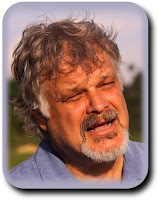 On our visit to his home a few months ago we discovered that his health had once again deteriorated and the rest of his family didn’t look a lot better than he did. His mother told us that when his father who was working in another village for a few weeks returned home that she would talk with him about Returning Antonio to Hermano Pedro so that he could regain his health. 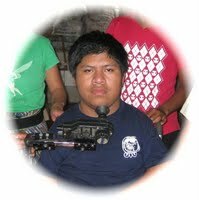 Since that time I have thought about him almost daily but knew that our hands were tied unless his parents decided that they wanted us to once again help them get Antonio admitted into Hermano Pedro. I was quite sure that Hermano Pedro would accept him back because unlike Juan Jose who’s father had taken him out of malnutrition against the hospitals wishes, the hospital had backed Antonio’s decision to see if he would do alright at home. Today when I mentioned that I wanted Antonio and his brothers and sisters to get some of the vitamins I could see in Julia’s face that something was wrong. Julia told me that Antonio had died. She also told me that Juan Jose who’s parents had taken him back home, even though the doctors at Hermano Pedro had pleaded with them not to, had also died. I am not sure that Juan Jose would have survived even if kept under the care of Hermano Pedro but I have little doubt that Antonio would have gained his strength back quickly just like he did when we first brought him there. I am recognizing more and more that we have to treat everyone that we come into contact with as though it may be the last time that we may ever see them, and by missing the opportunity to share Christ’s love with them we may not see them again for all eternity. Our second visit of the day was on the lighter side. Ludwig and his parents were glad to see us and even though he has muscular dystrophy he is doing quite well. He scarcely has enough mussel tone left to sit up on his own and can barely push himself around in his wheelchair but his spirits are high. I think the thing that keeps him going is the fact that he is now in school. His body may be slowly fading away but his mind is as sharp as a tack and he loves learning. After looking at his school work I told him that we wanted to take him and his parents out to eat as a reward for the good work that he was doing. Since I used to take him out to Camperos quite a bit when he was at Hermano Pedro I had little doubt as to where he wanted to go for supper. Soon he, his mother, his father, Calin, Abner, and I were on our way to Camperos. Fortunately there was one in a town that was about 25 minutes away. While we were at Camperos we spotted a motel across the street that didn’t appear to be too bad considering Saloma is not all that big of a town so I had the boys go over and check it out. $8 per night per person is a bit steep but the room had hot water, a TV, and 3 beds so after eating I went back over with the boys and paid $24 for our room. The Boys wanted to stay there while I brought Ludwig and his parents back to their town but I did not want them staying there alone. We are now back at the room and the boys are watching TV while I write in my Journal. I think that I will kick back for a while and then head off to bed. We got back home from Saloma at 4:30 PM. I told the kids that I needed a few hours so that I could finish up on my journal but if I got done before 8:00 I would let them in. That was 4 hours ago and I am just now starting on today’s journal. I have been spending the past 4 hours answering e-mails, returning phone calls, and answering the door bell to tell the kids that it is now looking more like 1 or 2 AM before I get my journal sent out. A few of them asked if they could come in if they waited until I was done but I said no. I hate to do that to them but a few hours of quiet time before morning comes always seems to be needed. I had a good rest last night and we didn’t get going until nearly9:00 this morning. Our motel room was nothing all that fancy but the beds were comfortable and we all slept well. The motel that we were in had a small restaurant but it was still closed at 9:00 so we went across the street to eat. You wouldn’t believe the name of the restaurant that we ate at today. Camperos! I think that there must be a Camperos in every town that has over a 1000 people in it. The food is always good but I have the menu memorized and am getting a little tired of having to choose between chicken and eggs for every meal. Most of the Guatemalans order Chicken no matter what time of day it is but I had eggs. I figured if everyone kept ordering chicken pretty soon there would be none left and no chickens means no eggs so Camperos would have to close down. After breakfast we packed up and headed back to Ludwig’s house. I had dropped a new wheelchair off there yesterday but it had gotten to late to fit it so we promised that we would come back there today. Ludwig was excited to see us and thanked Calin for the Camperos chicken that he had brought him. After all he hadn’t had any since last night. Ludwig’s sister, parents, and 2 nephews were there and everyone but mom wanted to get into the act of setting up Ludwig’s new wheelchair. While Calin and Abner did most of the work I tried to give each of the little kids the opportunity to at least tighten one or 2 bolts. Even Ludwig himself tried to help. Since he scarcely has the strength to sit up on his own and can hardly grip anything in his hands I set him on my lap an together we connected a few brackets onto his wheelchair. It was not until I held him that I realized just how much damage the muscular Dystrophy had done to his poor little body since the last time that I saw him. Hid legs now just dangle like that of a rag doll and the mussels in the rest of his body have degenerated to the point that if his head falls forward he no longer has the strength to lift it up under his own power. In spite of that this plucky 8 year old is still able to move him self around in his wheelchair under his own power. I am afraid that the day that he can no longer do that is just around the corner. When it comes I will be sure that we have a power wheelchair ready for him. 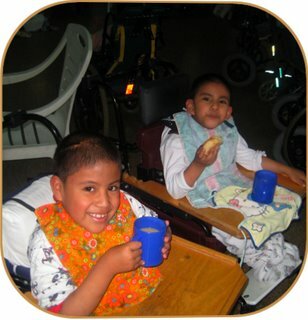 When we finally finished up on Ludwig’s wheelchair his family asked if we would have prayer with them. We didn’t get the opportunity to go to a formal church service today but the next 10 minutes that the boys and I spent with fellow believers will be hard to forget. Working with children who are here one day and gone the next is often heart breaking but being able to do nothing for them would be impossible for me to comprehend. They have all given me far more than I could ever give them.